Humans can easily detect and identify objects present in an image frame. The human visual system is fast and accurate and can perform complex tasks like identifying multiple objects and detect obstacles with little conscious thought and within less time. With the availability of large amounts of data, faster GPU, and better algorithms, we can now easily train machines to detect and classify multiple objects within an image with high accuracy. With the advancements in technology, there has been a rapid increase in the development of autonomous vehicles and smart cars. Accurate detection and recognition of traffic lights is a crucial part in the development of such cars. The concept involves enabling autonomous vehicles to automatically detect traffic lights using the least amount of human interaction. Automating the process of traffic light detection in cars would also help to reduce accidents as machines do better jobs than humans. The experiment was implemented using transfer learning of the Microsoft’s Common Objects in Context (COCO) pre-trained models and Tensor-flow’s Object Detection API.The COCO data set contains images of 90 classes ranging from bird to baseball bat. The first 14 classes are all related to transportation, including bicycle, car, and bus, etc. The ID for traffic light is 10.For the classes included in COCO data set, please see ‘mscoco_label_map.pbtxt’. Tensor-flow’s Object Detection API is a powerful tool that makes it easy to construct, train, and deploy object detection models. In most of the cases, training an entire convolution network from scratch is time consuming and requires large data sets. This problem can be solved by using the advantage of transfer learning with a pre-trained model using the Tensor-flow API.They have released different versions detection models trained on MS COCO data set,from which,I have selected 2 models to test my experiment.The selection of these models is based on mAP,mean Average Precision,which indicates how well the model performed on the COCO data set. Generally models that take longer to compute perform better. 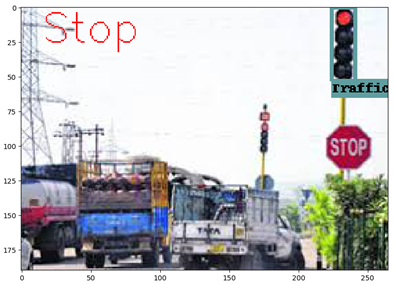 Once the object is detected in the image frame ,it then crops image and extracts only object’s frame which is further processed to recognize the dominant color in the object frame.For this experiment,we have detected Red and yellow colors in objects’s frame and not green color.The reason for detecting Red or Yellow is that car has to take Stop action whenever there is Red or Yellow light on Traffic Light.The default action for this experiment is ‘Go’ action. -Create a folder in C:Files and name it Google Protobuf. for /f %i in (‘dir /b object_detection\protos\*.proto’) do protoc object_detection\protos\%i — python_out=. # Size of the output images. To detect traffic lights and draw bounding boxes around the traffic lights,we need to specify directory paths for test images,model to be used,frozen detection graph file,lapbel map etc.This function will detect traffic lights and draw bounding boxes around them.It will also print Stop or Go based on values of stop_flag.If detected,it will change commands flag to true. This project was an attempt to perform object detection and color recognition on COCO data-set. The resulting model can be run directly on small devices like Raspberry Pi using Tensor-flow Lite format. To perform real time object detection on live video stream,the machine must be equipped with hardware capable to perform high computations quickly.This can be achieved using high end Graphical Processing Unit which have multiple cores to perform parallel processing for object detection. 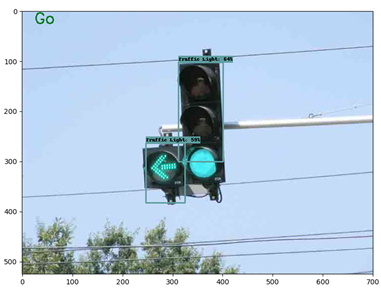 The broad objective of Object detection system is to make autonomous vehicles interpret surrounding environment and take actions better than humans.Self-driving cars are rapidly evolving as we see unimaginable innovation in hardware, software, and computing capabilities.But, cars have to perform object detection in real-time in order to detect objects approaching quickly and avoid them. There must be a very low latency time for high accuracy, meaning that very high computing and graphical power is needed. We’ll need to improve the power of our processor units in order to implement computer vision safely for autonomous vehicles. However, we also need a very accurate model upwards of 99.9%, since any mistakes made can be disastrous and cost human lives. Our current models have not achieved such high accuracies yet and we must generate more data to train on or design even better models. There are other better models for object detection like Faster-RCNNs but are still far from the accuracy we need. If we can improve object detection greatly, we’ll be one step closer to self-driving cars, and a safer and more convenient future. o Models trained on COCO data set have facility of detecting ~90 classes. o This can be used to detect multiple objects from image frame and perform analysis of objects detected. o Analysis includes number of detected objects and their bounding boxes. This type of projects can be useful in efficient traffic management. 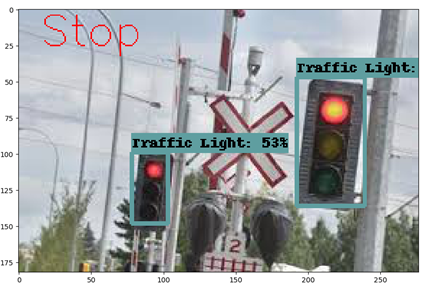 Here is an example showing object detection of multiple objects and their analysis.